Bel Sole is located approx. 3 miles west of Hwy 59S just past the Little Lagoon Bridge at 1910 West Beach Blvd in Gulf Shores, AL. Bel Sole is lagoon front with great views of Little Lagoon and views of the gulf, built in 2007. 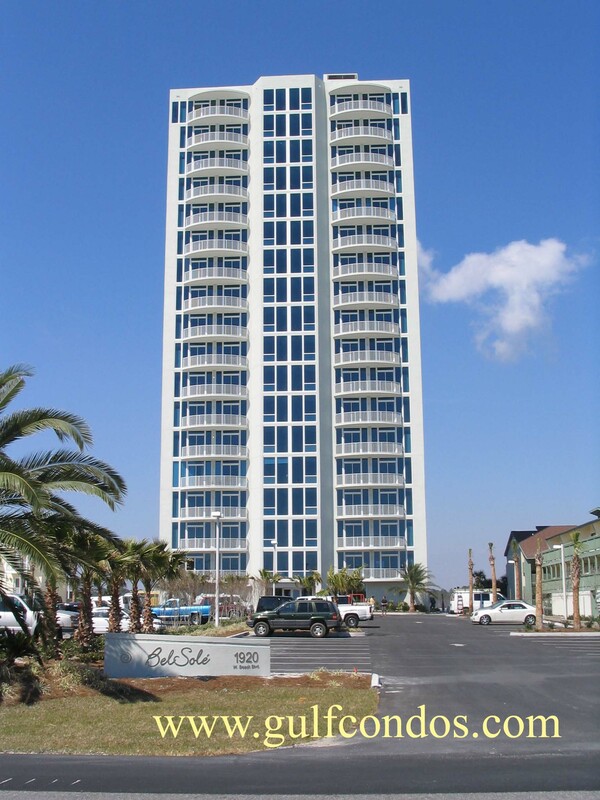 It has 18 floors consisting of three per floor; a total of 50 units, all three bedrooms from 1539-1988+/- Sq Ft, with the Penthouse unit having approx 2711+/- square feet. Units ending in 01 and 03 are corner units. Amenities include: Deeded Garages, Deeded Boat Slips, BBQ Area, Common Lobby, Exercise Room, Fire Sprinkler System, Gazebo, Steam/sauna, Indoor Pool, Outdoor Pool, Spa/Hot Tub, Private balcony and private beach.